We were definitely lucky with the kitchen as this was fairly new when we moved in so we didn't have to really do much apart from add a washing machine and fridge freezer along with all the other appliances you would usually have in the kitchen. It definitely has our own stamp on it already. I just need to try spend more time in there actually cooking and baking as when I do this I actually quite enjoy it. In the dining room we stripped all the walls changed a light fitting and switch as well as replacing the radiator. It is looking amazing now with its silvery/grey tones on the walls and the grey laminate. 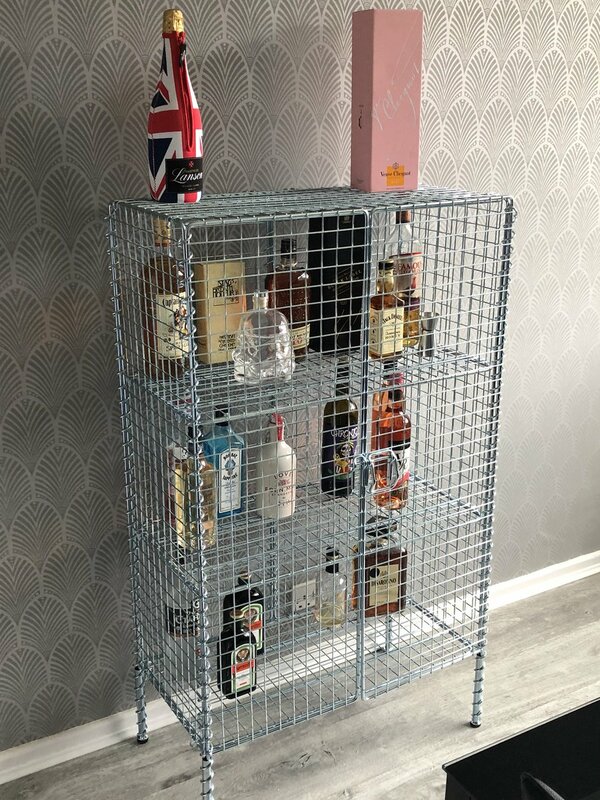 We also have the wonderful cage above from Ikea which houses all our alcohol. We also got a really nice glass table for in here which I love sitting up to with Liam for meals. We do have a few bits to do in here such as box in the radiator pipework, hang our curtains and finally get out bookcases so we can unpack more of the spare room. This is the room I am most impressed with at the moment. We wallpapered all the walls put a new carpet down, got comfy sofas, fitted a new fire and hung a new radiator. We then added some of our favourite images to the walls and it just feels so homely. Mornings are great just sitting there watching some TV and hopefully when we have more time we can get snuggled into a sofa each and watch some films. All we have to do in here now is change some sockets and finish off some boxing in. This was one of the first rooms we actually started on. We haven't done anything to the walls or carpet on here yet as we need to knock a wall down so are waiting until then for it, that way we aren't doing things twice. We are lucky as our hallway has a lot of space so one part houses all our shoes and work jackets and the bottom of the stairs has a coat rack with our best jackets hung and storage cubes filled with our hats and scarves. It is great not having things piled on top of each other and super easy to see. The top of the stairs is also where my signed Lucy Bronze shirt currently lives, which just adds to the plain walls. Another room we haven't started on, this is because we need to knockdown the wall separating the toilet from the rest of the bathroom. It just isn't cost effective to do at the moment plus the bathroom at the moment is och as it is. We have put a few plastic cupboards in to hold our toiletries and put some decor on the sides just to make it ours. I think when we are getting the bathroom done we will rip it all out and start a fresh. We got the bedroom done pretty quickly, new radiator was added along with a new carpet and new wallpaper. We have just had a new bed delivered for this too. We actually took the 2nd biggest room as our bedroom, which also had a built in wardrobe. All we have left to do in here is change the doors on the wardrobe, I stupidly promised Liam I would let him have chalkboard doors. The biggest room upstairs obviously had to be turned into our games room, we painted the walls in here added our desks, console unit and a sofa bed. This was one of the first rooms we got done and one of the rooms we spend the most time in. Not only do I game in here but it is where I blog too. The room is almost done we just need to add shelves for our collectables, bring more consoles in and add more artwork. It is already one of my favourite rooms. We have the wallpaper ready for one wall, the carpet is up and we can't wait to get it all done. I am really hoping to have it sorted by Christmas. We just need to empty all our other stuff out first then we are good to go. The carpet is ready and waiting, we need to wallpaper, hang a new rad, paint some wood and knock a little bit of a wall out but then it is just a case of adding the furniture, I really do think it is do able before Christmas and I will finally have my own space for getting ready on a morning. Breaking it down I don't think it will be that long until the main rooms are completely finished, which I really can't wait for, I just need to stop shopping so I have more money for doing the house up. I will be sure to do more posts on each room as they are updated/complete so keep an eye on those as I will also add plenty of images to them. The garden is definitely waiting until next year as there is just so much to do in it.